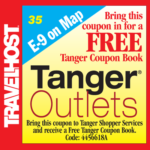 Show this coupon and save at Tanger Outlets in Branson! Tap coupon to enlarge. Tanger Outlets Branson, just a 10-minute drive from downtown Branson, features more than 70 shops and restaurants, and for those who are confused about its pronunciation — it rhymes with the word “hanger.” From designer accessories to brand name apparel, find exactly what you’re looking for at Tanger Outlets. At a whopping 30 to 70 percent off retail prices, Tanger’s discounts are among the best in Branson. Those with “champagne tastes and beer pocketbooks” need not worry — designer shops like Coach and Fossil are favorites among fashionistas. Jewelers like Kay, Helzberg and Zales offer remarkable markdowns on their finest gems. Specialty shops run the gamut, from the enchanted Disney Store to beloved Branson eats and treats like Mick’s Nut Shack and The Fudgery. Need a new outfit? An impressive collection of recognized brands like LOFT, American Eagle, Oakley, Eddie Bauer, Gap, Old Navy and more are waiting to be discovered at Tanger. 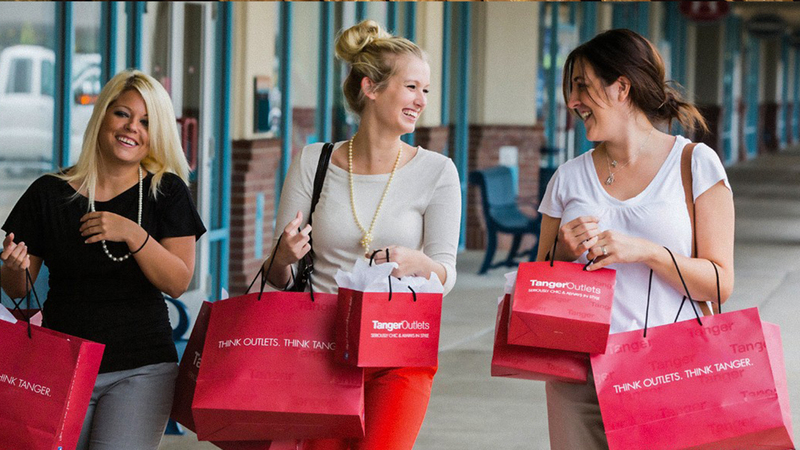 During their annual Tax Free Holiday Sale, Tanger Outlets is the place to go for unbeatable back-to-school savings. Usually taking place the first weekend in August, shoppers won’t be charged state sales tax on back-to-school items (check their website for exact dates and details). Find adorable getups for your wee ones at OshKosh B’gosh, the Children’s Place and Carter’s, or shop major brands with departments for kids and young adults, like Gap, Old Navy and Tommy Hilfiger. Before you begin your shopping extravaganza, stop into Shopper Services in suite 120. The folks at Shopper Services have helpful tips and tricks to make your Tanger shopping experience the best it can be, from accessing their free Wi-Fi to hopping aboard the mall’s complimentary shuttle service via on-site golf carts — after all, who doesn’t like riding around in a golf cart? What’s more, members of the military, AARP and AAA/CAA can receive special coupon books worth hundreds of dollars in bonus savings with one quick visit to Shopper Services.